Serval (leptailurus serval), this wild cat, naturally lives almost across the African continent (except sugar). A cat of medium size (can weigh up to 20 kg) having a thin, long body with a long neck and small head and large ears and long legs. Serval is also a cat of great beauty. All her skin is decked out with black spots, often yellow background - golden or brownish color, and, though less frequently found in silver or black. It's not a house cat. Has well developed hunting instincts of a wild cat. It is adapted to live in a large area, extremely mobile cat - while hunting at night may take a few kilometers from the place and jump up to 3 m hunting in the tall grass of the African savannah, marsh, forest and mountainous areas. Serval become food for various birds, rabbits, mice and other rodents, small animals living in the swamps and in the water: fish, frogs, various insects, reptiles, but their prey can be small and very young or sick antelope. 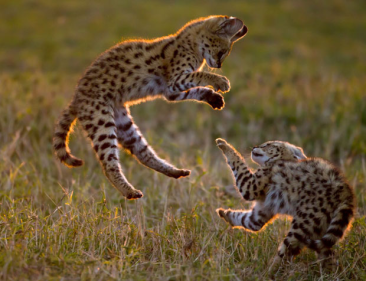 Compared with other cats that catch about 10-20 % of their chosen victims, Serval is a very effective hunter and catches up to 60% of selected victims. Serval dangerous for leopards and other wild cats. However, the most dangerous is the man for him, because the whole hundred years serval hunted for its beautiful skin, though not as precious as the other big koshkek . In addition, many indigenous tribes in his hunted both for food. First serval as a pet and the pet has kept the ancient Egyptians more than 5,000 years ago. In Europe, the Serval has been known since the Middle Ages . While the Europeans were able to bring it out and keep as a pet. And , despite the fact he is good in what conditions and in what holds it is good condition, to this day, he did not fully tamed pets, affectionate pet kitten or a plush toy. This cat individualist, always emphasizing its wildlife and independence. Thus, the Serval is not good pets, it is not suitable for the maintenance of the house because of its very nature mobile, large areas required to run, constant supervision, especially large labeling area and other strong instincts formed cats. Its strong claws and sharp teeth can cause serious damage, even unintentional . 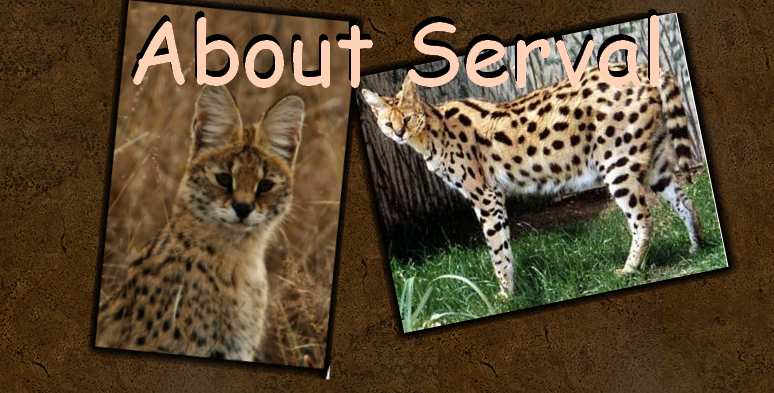 On the basis of Serval, when crossed with his domestic cat and trying to use all the positive qualities of Serval and suppress its flaws, after many attempts for the first time in the U.S. was brought home a new breed of cat and exotic appearance, which was named Savannah. This is a real pet and a real house cat.